In my next post, I'll explain the steps behind the motion detection. But for the impatient, right below are the command line arguments and the source code gist. Compile with OpenCV 2.4.3 or above. Also needs libconfig for config file storage. to save a configuration file with the adjusted parameters type 's' while on the application window. A file with name "motion_detect.cfg" would be saved. append 'act' to the commands above. Do download the source code and try out this application and do share with us if you come up with any improvements. 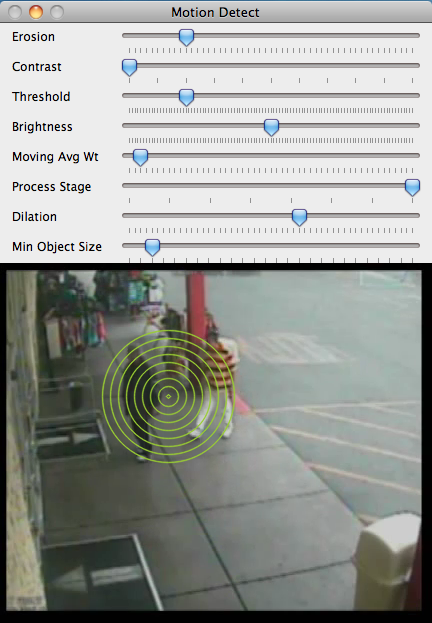 In my next post I'll go through the image processing steps used for motion detection. Had a look at your post. That's an interesting and unique approach Hardik! Will have a deeper look.